Reference number for this case: 4-oct-54-Poncey. Thank you for including this reference number in any correspondence with me regarding this case. Dijon. -- A resident of Poncey-sur-l'Ignon (the Côte-d'Or), Thérèse Fourneret, aged 23, came to declare to the gendarmerie of Saint-Seine-l'Abbaye that Monday night, around 7:30 p.m., she saw land in a meadow near the asbestos factory where she lives, a sort of spherical machine of orange color and it seemed to be "about the size of a large stove." Panicked, she took refuge with neighbors who, also frightened, remained caulked for nearly an hour before daring to show their face at the window. When they did, the craft had disappeared. The police went to the location and found at the place indicated by Ms. Fourneret as that of the landing, clear marks on 1.50 meters ray; the grass of the meadow had been ripped in places and clods thrown to a distance of about 4 meters. Photographs were taken by the police. Limoges, October 7. -- A farmer of Chalaix (the Dordogne), Mr. Gareau, claimed on his honor, to have seen a "flying soup tureen" come to land on his property. Mr. Gareau stated that two perfectly normal men covered of khaki suits came out of it, shook hands with him and spoke a language unknown to him. Mr. Gareau, amazed, did not answer. The two men caressed his dog and went up in their apparatus that flew away without noise at a vertiginous pace. At the place indicated by Mr. Gareau, it was noted that the grass had been pressed. Two inhabitants of the Island of Ré stated to have been witnesses of the same phenomenon. Two Parisian on holiday in the community of Mouchamp, Mr. and Mrs. Laroche, claimed to have seen, at the fall of night, an incandescent sphere. Mrs. Thérèse Fourneret, 23 years old, living in Poncey-sur-Lignon (the Côte d'Or) saw Monday evening, a machine come to land in the meadow not far from her residence. She stated that, frightened, she had taken refuge at neighbors'. The gendarmerie noted very clear traces on the ground at the indicated place. Turfs had been torn off and projected in a radius of 4 meters. Poncey-sur-L'Ignon (C. d'Or. - France) - October 4, 1954 - Landing. Investigator: Mr. Charles GARREAU, Member of the Studies Committee, Regional Correspondant C.I.E.O. It was approximately 8 o'clock in the evening. For one hour the night had fallen. An inhabitant of PONCEY-sur-l'Ignon, Mrs. FOURNERET, a young woman aged 23, was on the point of closing the shutters of her bedroom. She lives together with her husband in a house contiguous to the asbestos factory of Poncey, where her husband works. The factory extends between two wooded slopes from the hills, at a few hundreds of meters of the village. On Monday evening, Mrs. Fourneret was alone. She was on the point of getting her young child to sleep, and opened the window. What she saw nailed her on the spot. At some twenty meters, a luminous body was gently wobbling in the air with height of the plum tree, as if it prepared for landing. Its dimensions? "Approximately three meters in diameter ", specifies Mrs. Fourneret for me. That is all that she can provide as precisions. Hardly does she remember that the object was of yellow orange color, slightly illuminating the foliage of the nearby plum tree. During one hour, Mrs. Fourneret and Mrs. Bouiller remain locked at home. At this point in time two neighbors arrive, Misters Girardot and Vincent. Informed, they are get their rifles and move towards the meadow. There is nothing left, neither machine nor "Martian" on the prowl. But, within less than three meters of the tree's trunk, a very fresh print attests that Mrs. Fourneret did not dream. Forming a trapezoid, with rather irregular sides, of 1 m 50 approximately of length, 0 m 50 at its small base and 0 m 70 at its large base, a whole surface of pre like was like pickled, exposing the ground. On the very fresh abrasion, white worms are still agitated, cut in two. The grass fell down in mounds, in a radius of 3 to 4 meters following to a vaguely ovoid contour, which roughly speaking follows the shape of the tear. On its edges, the ground is "excavated" under the grass. It seems that this part of the meadow was sucked up with an extraordinary violence, at the moment of the departure of the machine, and that the raised mounds are repercussions in sheaf, like the drops of a water fountain. An odd detail: a plant with deep roots has remained, alone in the center of the naked ground. No traces of burns. No prints in the neighborhoods. And yet the machine remained at least half an hour in the same place. Indeed, returning from his work, François Bouiller, a 18 year old young man, saw it when it gained altitude, directing to the south. "I was terribly frightened, young François tells me. I saw this machine which slipped by in the night, taking a greenish yellow color as it moved away. One would have said a plane's fuselage without wings." François returned at his place, making a frightened face. What he saw comes to confirm the declarations of Mrs. Fourneret. Other people of the area also saw the cigar when it went away. Alerted, the gendarmes of the brigade of Saint-Seine came to carry out an investigation under the direction of captain Millet, in command of the squad of Semur. Photographs were made and samples were taken. I for myself carried out sampling of the ground, which I subjected to various scientific organizations of Dijon and Paris. Negative results with the Geiger counter. The investigation lead by the gendarmerie of Dijon and the police force of the air could not establish with certainty the nature of what had landed. But it concluded to the reality of a landing after having drawn aside any possibility of a staged hoax or mystification. The very next day, in Paris, I met Mr. Decker, chief engineer, director of the service of the special Machines of the Air Force. I told him of the strange story. Very disturbed, and without being able to decide, he also rejected any idea of trickery, admitting as "highly probable" the landing of an unknown machine. French ufologist Aimé Michel gave a detailed and lively account of this case. Here is its substance. On October 4, 1954, at about 08:00 P.M., Mrs. Fourneret of Poncey-Sur-l'Ignon is inside her residence. The night has fallen, so she goes towards a window to close the shutters, she then sees a luminous object hovering with gentle oscillations in the air at about twenty meters of the house, on the right of the plum tree on the field of a neighbor, Mr. Cazet. She stated that the luminous object seemed to get ready to land. She described the luminous object as being approximately three meters in diameter and with an elongated shape, horizontal, and of orange color, with a luminosity which slightly lit the branches and the leaves of the plum tree. Frantic with terror, she takes her little child and takes refuge with him at a neighbor's, Mrs. Bouiller, and the two women carefully close the door. At this time, two neighbors, Mr. Girardot and Mr. Vincent show up, note the state of panic of the two women and ask what happened. When being told, they get their rifles and run towards the field, where the object is nowhere to be seen anymore. "On a surface of 1,50 meters long, 70 centimeters broad at its base and 50 at its end, the ground seemed to have been sucked up. On the very fresh abrasion, white worms were still agitated. The torn off ground was widespread all around the hole in mounds of 30 centimeters in diameter on a radius of 4 meters approximately. On the internal edge of the hole, mounds hung towards the inside: the ground had been eroded underneath, so that at half of its average depth, the surface of the hole was larger than on the level of the ground. But, more astonishing, no trace of instrument explained the extraction of this mass of ground. Even better (and it is that especially which could never be explained): the small roots and rootlets of this fertile Burgundian soil were intact on all of the internal surface of the hole; none was cut, as if it would have been the case if one had dug the excavation with any known means. A detail struck everyone: in the medium of the hole, a plant with deep root was laid down, attached to the ground at its bottom by the end of its root, rootlets in the air, without any damages. In short, all happened as if the ground mass spread in the grass around the hole had been sucked by a gigantic vacuum cleaner. Same characteristics on the mounds scattered around in the grass: neither cut roots, nor traces of instrument, no burns, no prints. Many people tried to reproduce the phenomenon since. With no success." 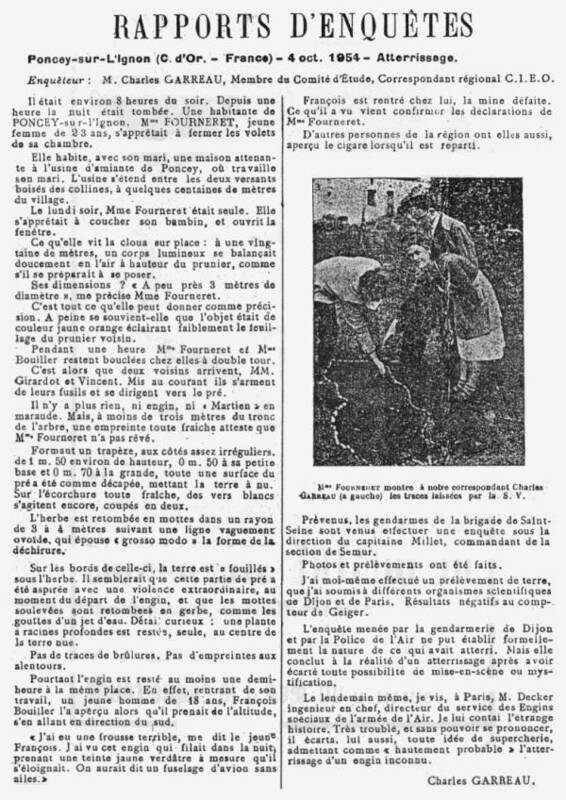 October 4, 1954, towards 20:00, Mr. Fourneret and some potato gatherers were gathered together at Mr. Cazet's, the Mayor of Poncey-Sur-l'Ignon, when a villager came on a bicycle, breathless, and called Mr. Fourneret, shouting to him to come quickly, as Yvette, Mr. Fourneret's wife, "saw something in the field" in front of Mr. Fourneret's house, had been frightened and took refuge in the residence of Mr. Bouiller, near Mr. Fourneret's house. The entire group goes to Mr. Fourneret in some minutes and finds Mrs. Yvette Fourneret, her young son, Mr. and Mrs. Bouiller, and two other neighbors, Mr. Girardot and Mt. Vincent. Everyone hears Mrs. Fourneret's story, and gathered around the hole. At this time, François Bouiller, aged 18, shows up, returning from work, and before anyone can tell him about the reasons of the gathering, he explains with great excitation that he just had the fright of his life, for he had just seen a sort of luminous craft which flew at high speed towards South-east while gaining altitude. He describes the craft as similar to a plane without wings, reduced to its only fuselage, which took an increasingly greenish color as it accelerated. On October 5, 1954, at about 07:00 P.M., the Mayor of Poncey-Sur-l'Ignon, Mr. Anatole Cazet, phoned the Gendarmerie station at Saint-Seine the Abbey and tells them that a flying saucer had landed in a field the day before and that several people saw it. He adds that the machine left unexplainable traces. The Sergeant is skeptic enough but indicates that he will come to the premises for an investigation. Meanwhile, many inhabitants went on the spot of the landing and contemplated the trace. All were very excited by the event. The Gendarmes who carried out the investigation collect the testimony of several other people in the area who stated to have seen a luminous object which had risen near Poncey and had slipped by in the direction of the South-east, shortly after 08:00 p.m. on October 4. On-field investigations were carried out by Charles Garreau, by the Sergeant of the Gendarmerie of Saint-Seine-l'Abbaye, who initially thought that he was going to find a simple hoax there, changed opinion in consequence of the investigation, and contacted his superior Captain Millet of Sémur-in-Auxois. Captain Millet went to the site, with the firm idea that his subordinate had been fooled by pranksters, but after having interrogated the inhabitants and having examined the trace, he changed opinion and contacted his own superior, Commandant Viala of Dijon. Viala organized a follow-up investigation by the services of the Aeronautics of Dijon, by the Air Force, and an unnamed professor of the University of Dijon who tried to check if the ground were radioactive and determined that it was not. Photographs and soil samples of the trace were taken. Metallic objects of the neighborhoods were checked against magnetic remanence traces but nothing could be found. The case also interested General De Chassey, c.o. of the Dijon Air Force Base. The entire case circulated up to the highest official authorities within only two days. The totality of the people having taken part in the investigation, gendarmes, military, scientists, ufologists all were convinced that the case was absolutely not a hoax. Aimé Michel carried out checks against the ground samples at the Institute for Radium, in Paris, he could not detect any radioactivity. He regretted later than at that time nobody had thought of performing what decades later became a common practice in these cases: the search for alterations in the roots of the plants and in the plants. Michel deeply thought about Lieutenant Plantier's theory. Plantier, of the French Air Force, had a few years before written a speculative study on the problem of the propulsion of the flying saucers and emitted an idea which was quite new and daring for those times: flying saucers may be propelled by creating their own flexible gravity field. Michel thought that the fast departure of the craft would have quite simply involved an upwards fall of the ground under the machine, which seems to be the only judicious assumption to adapt the so particular characteristics of the trace, where all looked indeed to be as if gravity had been reversed in this place, the ground initially "falling" towards the sky, leaving the roots intact, then falling down to ground on the sides of the hole once the machine and its gravitational effect left. It was about 8 p.m. on 4 October, 1954. The place Poncey-sur-Lignon, France. "About twenty yards from the house, in M Cazet's meadow, a luminous body was balancing itself lightly in the air, to the right of the plum tree, as if preparing to land. As well as I was able to judge, this object was about three yards in diameter, seemed elongated, horizontal, and orange coloured. Its luminosity threw a pale light on the branches and leaves of the tree." The witness had made a noise which seemed to disturb the strange vehicle, for it had immediately taken off "forward and upward at prodigious speed, leaving a gaping hole in the ground over which it had hovered." Over an area, a yard and a half long, 27 inches wide at one end, 20 inches at the other, the ground appeared "to have been sucked up." "On the fresh soil of this hole, white worms wriggled. The earth that had been torn out was scattered all round the hole, in clods ten or twelve inches across, over a radius of about four yards. On the inner edge of the hole, similar clods hung down; the earth had been pulled out in such a way, that about half way down, the hole was wider than at ground level. In short, it looked just as if the mass of earth spread over the surrounding grass had been sucked out by a gigantic vacuum." Michel Carrouges indicates that the Fourneret observation was made at a distance of 20 meters. 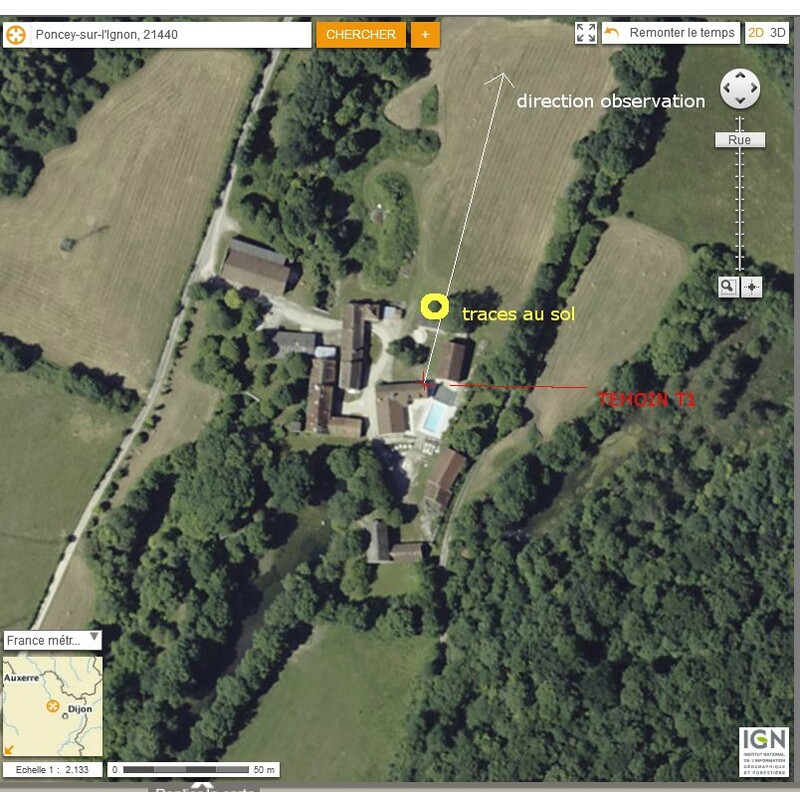 Another landing which does not involve operators of any kind but which, nevertheless, is one of the most interesting of all those recorded in the files of UFO buffs, took place at 8 P.M. on October 4 at the village of Poncey-sur-l'Ignon. On the evening of the 5th, the mayor called St.-Seine and reported that a flying saucer had landed the night before, that many people had seen it, and further, that it had left unexplainable marks. This sort of case, as well as the "flying balance" incident, is the type with which UFO buffs love to confront the skeptics, for it is not easily explainable by any stretch of the most agile imagination. But back to Poncey-sur-I'Ignon. At 8 P.M. M. Fourneret and some potato pickers were at Mayor M. Cazet's house when a villager rode up on his bicycle, obviously agitated and out of breath. He told Fourneret that his wife Yvette had seen something in the field in front of the house and that she had become terrified and had run next door to the home of the Bouillers. Within a matter of minutes a fair-sized crowd was gathered at the Fourneret place where Yvette Fourneret, her young son, the Bouillers, and two other neighbors, M. Girardot and M. Vincent, were excitedly talking over what had happened. Mme. Fourneret told her story to the police chief of St.-Seine, Captain Millet of Semur-en-Auxois, Commander Viala of Dijon, and Mr. Charles Garreau, also of Dijon, who is a collaborator of Aime Michel's. Civil air authorities of Dijon, elements of the French Air Force, a professor at the University of Dijon, and General de Chassey, commanding officer of the Air Force contingent at Dijon, all were involved in the investigation. Michel himself made tests at the Radium Institute in Paris. Briefly, the story is this: Mme. Fourneret had been in the house and had started toward the window to close it when she saw a luminous body balancing itself in the air near a plum tree and it seemed about to land. She estimated its diameter as about three yards, it was elongated and orange-colored. The light from the object illuminated the branches and leaves of the tree. Terror-stricken, Mme. Foumeret grabbed her son, ran to the Bouillers' house where she and Mme. Bouiller closed the door. Girardot and Vincent arrived, and after hearing the story, got their shotguns and ran toward the meadow, but when they got there the object was gone. But it had left traces. An area measuring twenty-seven inches wide at one end, twenty inches at the other, and extending about a yard and a half, appeared to have been "sucked up" out of the ground. Wiggling white worms were found in the fresh soil, and the earth that had been tom out was scattered around the hole, the clods ten or twelve inches across and spread over a radius of about four yards. On the inner edge of this hole other clods hung down; it appeared that the earth had been sucked out in such a manner that about halfway down in the hole it was wider than it was at the top. No one was able to explain how the hole had been made. Attempts -were made later to duplicate the hole but to no avail. Tests for radiation revealed nothing, and examination of the dirt itself yielded nothing unusual. 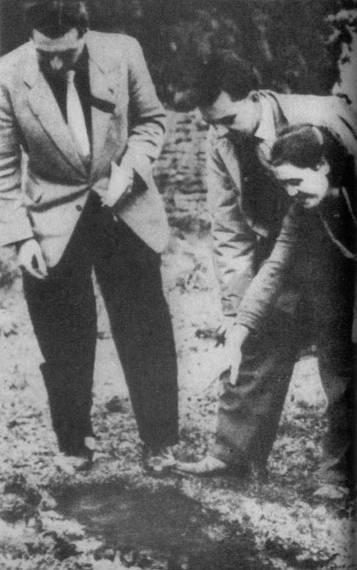 Michel, as a part of his report on the Poncey-sur-l'Ignon incident, theorized what could have caused the hole to be made in such a peculiar way, and it is related to the theory of Jean Plantier (La Propulsion des Soucoupes Volantes, Paris, 1955), which is gone into to some extent in Michel's first book, The Truth about the Flying Saucers. Mrs. Fourneret, housewife, flee at the sight of a circular orange object 3 meters in diameters, balancing itself in the air and which landed close to her farm. When Mr. Girardot and Mr. Vincent arrived with their rifles, they found that the ground "had been sucked up" on the surface of a quadrilateral. Mr. François Bouillier confirmed to have seen a luminous object in flight. An investigation was carried out by the Gendarmerie and the French Air Force. The author indicates that on October 4, 1954, in Poncey-sur-Lignon, a housewife fled when an orange, circular object of approximately 3 meters in diameter was oscillating in the airs and landed close to her farm. When her neighbors arrived, armed with rifles, they observed that the ground "had been sucked" on a square surface, so that the idea of a joke had to be abandoned. Extensive research and analyses were made by the police force and the French Air Force. The nature of the object, just as the traces it had left, remained unexplained. Mme. Guainet was milking her cows in the byre, when her dogs, which usually stayed near her while she milked, rushed out towards the woods, baying. she followed, and saw a vast illuminated "cigar" craft flying low. Aimé Michel: Flying Saucers and the Straight Line Mystery, p. 109. "...and it had already been dark for some time. About twenty yards from the house, in the meadow, a luminous body was balancing itself lightly in the air, to the right of the plum tree, as if preparing to land. As well as I was able to judge, the object was about three yards in diameter and seemed elongated, horizontal and orange colored. I was beside myself with fright and seized the boy, running with him to Mrs. Bouillier's house, where we closed the door tight." The author indicates that the neighbors armed themselves and went out to investigate. Nothing was there, but they said they found an area over a yard and a half long, twenty-seven inches wide at one end, twenty at the other, where the ground appeared to have been sucked up. On the fresh soil of this hole, they said, white worms wiggled, and the earth that had been torn out was scattered all around the hole in clods ten or twelve inches across, over a radius of about four yards. On the inner edge of the hole similar clods hung down. The earth had been pulled out in such a way that about halfway down the hole was wider than at ground level. They reported further that the little roots and rootlets in this fertile soil were intact everywhere on the inner surface of the hole and that not one had been cut, as would have been the case if the excavation had been made in the normal way. At the center of the hole, they said, lay a plant with a long root, still attached by the end of the root to the soil at the bottom of the hole, with all its rootlets exposed to the air, completely undamaged. In short, if we are to accept this report,... it looked just as if the mass of earth spread over the surrounding grass had been sucked out by a gigantic vacuum. 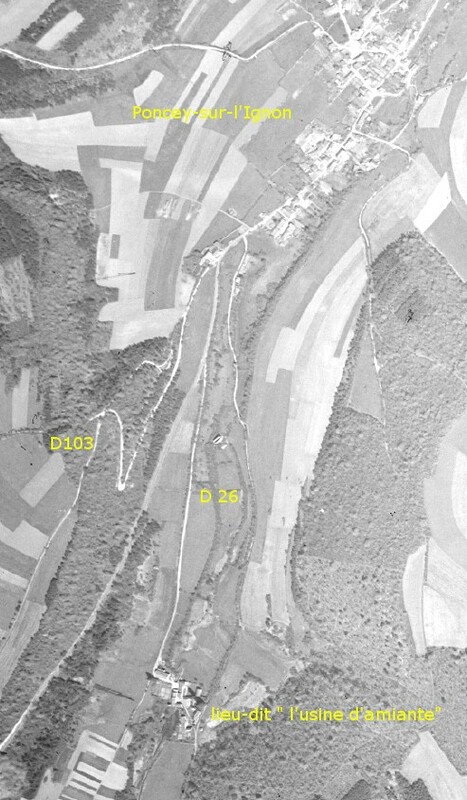 9 = "seen on ground" or "close to the ground"
The authors describe the case of the landing in Poncey-sur-l'Ignon on October 4, 1954, noting that the gendarmerie investigated it lengthily. In Poncey-sur-l'Ignon in the department of Côte-d'Or,at 8 p.m., Mrs. Yvette Fourneret, in her thirties, in her apartment of the old asbestos factory located at a few hundreds of meters of the village, close to the National Road RN71 from Dijon to Troyes. She opened the window of her kitchen to close the shutters, whereas the night had completely fallen and the outside was very dark. This window, located on the back of the building, faced the countryside, i.e. a very narrow valley boxed between two hills with rather stiff slopes. Mrs. Fourneret indicated the day after the sighting Charles Garreau who came to interview her, that she had thrown a casual glance at the meadows behind the house, and that she then saw a luminous object which gently swinging, on the right of a plum tree, as if it prepared to land. She stated declared that the tree, which was some 20 meters from her window, was slightly lit by an orange gleam coming from the object. The object had an oval form, horizontally lengthened, with a length that seemed to her to be of approximately 3 meters. She became panicked and closed the window, then took her baby on the arm and fled by the front door to the house of a neighbor, Mrs. Bouiller, and the two women barricaded themselves while waiting for the return of their husbands. But it was first two other neighbors who arrived, Girardot and Vincent. They noted the panic of the two women and decided to go to see the object, taking their rifles. They run to the meadow but there is nothing anymore. While looking near the plum tree, they discovered that on a surface of 1,50 m long, broad at its base of 70 centimeters, and at its end of 50 centimeters, the ground was like sucked up. Grass mounds were torn off and thrown around, turned upside down, in a circle of ten meters in diameter. The ground was removed by below, with the result that the bottom of the hole was broader than on the ground level. Charles Garreau examined this trace 24 hours later, and it made him think of an enormous suction which would have torn off the grass, except however for a wild plant that remained rooted as if it resisted, alone in the middle of the pickled surface. He noted that the lumps of earth were like if they had rained around the hole. Charles Garreau took one of the mounds and brought it to Aimé Michel, who had it analyzed and checked by various laboratories, but nothing was not found by these examinations. He notes however that neither him nor Aimé Michel had heard about the US Air Force's ATIC discovery on another trace case (that of Sonny Devergers), in which the roots of the grass had been superficially carbonized without showing damages on the leaves. "I have just had one of these jitters. I saw a kind of luminous craft rising in the direction of the South-east. You would have said a fuselage of an plane, without wings, and it accelerated very quickly. Its color gradually changed to green." Charles Garreau notes that Commander Viala and Captain Millet, of the gendarmerie, the air police force, the intelligence service of the Chief of Staff of the 1st Air Area came to investigate in turn into this landing, and that it revealed another sighting two days before, that of a luminous craft in the shape of an "oil barrel" which had flown over the village while following a trajectory parallel with the road from Dijon to Troyes. "During four years, the grass did not grow back at this place." The author indicates that on November 4, 1954 in Poncey-sur l'Ignon in Burgundy an excavation, 50 to 70 centimetres broad by 150 centimeters in length was produced in a field where a luminous object had been posed during a few minutes. The ground seemed to have been torn off by an ascending force leaving the roots of the plants naked, and falling down in mounds around the hole. The author indicates that his sources are Alerte dans le Ciel by Charles Garreau, page 239, 1956, and Aimé Michel in Mystérieux Objets Célestes, page 118, 1956. The author indicates that the saucers often have a swinging movement, or an oscillation, such as in Poncey on October 4, 1954. The two authors indicate that in Poncey-sur-l'Ignon in the department of the Côte-d'Or on October 4, 1954, at 07:30 p.m., whereas she was in her bedroom,Mrs Fourneret Yvette, 23, was closing her shutters, when she saw at approximately fifty of meters of her residence and above the trees, a luminous thing having the size of a cooker which was swinging gently in the air, on the right of a plum tree. This object lights the branches and the leaves of the tree. Frightened, she flees, with her child in the arms, to a neighbor's, Mrs. Bouiller, 41, while passing by the back of her residence not to be in contact with the luminous phenomenon. She cannot explain what she had just seen only five minutes later to her neighbor and a friend of the latter. One hour later, François Bouiller, 18, workman, and Mr. Jacky Girardot, military officer, arrive, they warn a neighbor, Mr. Marchand, and then proceed to the place, armed with their shotguns, and in company of the first. In the meadow next to the courtyard, they discover traces. Another member of the neighbor's family who was regaining his residence towards 08:45 p.m. saw in the sky an unknown object in the shape of large cigar, sort of like a fuselage of a plane but shorter and without wing, entirely luminous, the color which one would have said to be transparent had green and orange reflections. It could have been at a thousand meters of altitude, it moved north to the south, a double the speed of a jet airplane. Frightened, he went back to his residence, where he found the members of his family who had already noted the traces left by the luminous ball. The latter were within a few meters of the plum tree whose foliage had been lit by the ball, it had a surface of 1 m 50 broad at its base of 70 cm and its end of 50 cm, the grass had been like sucked. Grass sods of 0 m 20 by 0 m 30 were widespread and were turned over around on a radius of 4 meters. On the very fresh hole, white worms were still agitated. The commander of section of the Gendarmerie came on the location. An investigation was carried out and was the subject of the official report Nr. 391 of the brigade of Saint-Seine-l'Abbaye. Samples were taken. A lump of earth was presented to a Geiger counter of the university of Dijon. Result: nothing, no radioactivity. A mound was examined by Aimé Michel with instruments of the Institute of the Radium with the same lack of success, and this small piece of ground would eventually be thrown away. The authors indicate that the sources are case 194 of the Vallée catalogue; Aimé Michel in "A Propos des Soucoupes Volantes" page 197; C. Garreau and R. Lavier in "Face aux E.T" page 39. The authors indicate that on October 4, 1954, a "quasi-landing" "seems" to have been "certain" in Poncey-on-Lignon in the Côte-d'Or, having rather numerous witnesses and important traces on the ground. Initially, Mrs Fourneret, when closing her shutters towards 07:30 p.m., saw an oval luminous object of yellowish color which was gently swinging about fifteen meters above the ground near a close plum tree. Thrown into a panic, she fled to neighbors' with her child in the arms, taking great care to pass "behind" the house to avoid being in contact with this worrying light. Other witnesses saw a luminous phenomenon in the sky, but more remote. One hour later, when the men returned, they went on the spot with neighbors, armed with rifles, and discovered near the plum tree a surface of 1.50 meters out of 0.70 meters where the grass had been torn off recently since "the white worms are still agitated there." These plates of this grass from 20 to 30 centimeters side and "turned over" were scattered around at a distance of several meters as if they had been torn off the ground by aspiration. The authors indicate as sources "A propos des S.V." by Aimé Michel, page 167; Ch. Garreau and R. Lavier in "Face au E.T." page 39. "It was about 8:00 p.m. Night had already fallen. I walked over to the window to close the shutters and it was then that I saw the 'thing' I happened to glance outside. "About 65 feet in front of the house, in M. Cazet's field, a luminous body was swaying lightly in the air near the plum tree, as if getting ready to land. As near as I could judge it was about 10 feet in diameter, was an elongated form in a horizontal position and was of orange color. It glowed rather feebly, but enough to light the branches of the nearby trees. "Scared to death, I took the little one and we ran to Mme. Bouiller's my neighbor, where we closed the door. M. Girardo and M. Vincent arrived by chance. Seeing our fright they asked what had happened. After we told them they armed themselves with rifles and ran toward the field. There was nothing there. But on examining the ground they found a fresh track proving that I had not been dreaming." 46. We have to make one correction here. The "track" left by the object was much more than that, it was a huge hole, a hole impressive enough to attract investigators from all over the country! The crowd at the Bouiller's house went to the site of the supposed landing, and while they stood around talking, the Bouiller's 18-year-old son ran up bursting to tell what had happened to him moments earlier. Ignorant of the excitement at the Fourneret's, the youth exclaimed that a "luminous machine" of a greenish color had zoomed passed him as he approached the village on his way home. 47. The author indicates that on October 4, 1954, in Poncey, France, Mme Fourneret and her son saw an elongated "body", 10 feet - 3 meters - wide, luminous, orange, land about 20 yards - 18 meters - from their house. They fled. Aemed neighbors investigated soon after and found a large freshly-made hole that looked as if the earth had been sucked out of it. The earth itself was nowhere to be found. The author indicates that on October 4, 1954 in Poncey-sur-l'Ignon, Côtre-d'Or, Mrs. Yvette Fourneret, aged 23, sees a luminous body of three meters in diameter above the trees at approximately 50 meters of her home. She is frightened and flees with her child at her neighbor's Mrs. Bouiller. A little later François Bouiller and the neighbors discover traces in a meadow adjacent to the yard of Mrs. Fourneret's house, at the place above which the phenomenon had been. The grass was sucked up on a surface of 1.50 meters by 0.60 meters and plates of 20 to 30 centimeters are turned over and spread on a 4 meters radius. On the cut part, white worms were cut into two. Jean Sider indicates that source is "Les Dernières Dépêches" of Dijon, for October 7, 1954 at pages 1 and 10, and that the gendarmerie of St.Seine L'Abbaye made an investigation and took ground samples which did not give any result, according to Figuet p.121. He indicates that it is also advisable to read an investigation report in Ouranos. The author indicates that on October 4, 1954, in Poncey-sur-l'Ignon in Burundy, an orange disc landsed and left a hole where the ground was sucked up and thrown around symetrically in packs. The Belgian ufologist indicates in her catalogue that in 1954, the 4th, or 6th, of October, in France in "Poncey sur Lignon", "closing her shutters, Mrs. Thérèse Fourneret sees a luminous object, red orange, which lands silently in a meadow. She flees in panic at her neighbors' who ...'lock up the door. Meanwhile other more courageous witnesses, Misters Girardot and Marchand, armed with rifles approach the craft, but it suddenly takes a greenish hue, takes off vertically and disappears in the night in the blonk of an eye. At the landing spot one notes that the mounds were literally torn off without a trace of tool being detectable? certain plants are still hung by their deep roots, but the ground which furnished the latter was like sucked. The analysis of the lumps of ground does not reveal anything." She indicates that the source is "Jean PLANTIER: 'La propulsion des Soucoupes Volantes par action directe sur l'atome' éd. MAME 1955, p. 117, 118 qui dit 6 octobre". She indicates that another version is: "Around 19 hours (20:00?) Mrs. Yvette Fourneret flees at the sight of a circular orange object 3 m in diameter, swinging in the airs and which lands close to her farm. When Mm. Girardot and Vincent arrived with their rifles, they found that the ground had been sucked up on the surface of a quadrilateral. François Bouiller confirmed to have seen a luminous object in flight. Investigation by the gendarmerie and the French Air Force." She indicates that the sources are "Franc-Tireur, l'Aurore, Libération, 7 Oct.; France-Soir, Paris-Presse, 8 Oct. 1954. Anatomy 71. Jacques Vallée: 'Chronique des apparitions ET' - DENOEL 1972 - J'AI LU COLL. - p. 267" and "Henry DURRANT: "Premières enquêtes sur les Humanoïdes ET" - Laffont 1977 - p. 199." She indicates that another version is: "a hole 50 to 70 cm broad and 150 cm long was produced in a field where a luminous object had landed during a few minutes. The ground seemed to be torn off by an ascending force, leaving the roots of the plants naked, to fall down then by mounds around the hole." She indicates that the source is "Michel BOUGARD: 'Des S.V. aux OVNI' - SOBEPS 1976 - p. 193, who puts the date as November 4, 1954". She indicates still another version saying: "Yvette Fourneret saw, when closing the shutters of her bedroom at some 50 meters, above the trees, a luminous bodyt having the size of a cooker, which swung above a plum tree of which it lights the branches and the leaves. Frightened she flees at the neighbor's Mrs. Bouiller, with her child on the arms. Shocked, she cannot explain what she had just seen. One hour later François Bouiller, Mr. Girardot and Mr. Marchand, armed with rifles, in company of Mrs. Fourneret and find traces in the meadow contiguous to the yard." She indicates that the source is "M. FIGUET/ J.L. RUCHON: 'Ovni, Premier dossier complet...' Alain Lefeuvre pub. 1979, p. 120". "Two days later, in the same small village, on Monday, October 4, at 19h30, Mrs. Fourneret, while she was going to close the shutters, saw, at 50 m, as posed at the top of a plum tree in the nearby field, a disc flattened at both ends which emitted a soft orange light. Frightened, Mrs. Fourneret took her baby and fleed at a neighbor's where they locked themselves up during an hour while waiting for their husbands. Armed with rifles and equipped with flashlights, the latter checked the location. They would discover a rectangular surface of 1,50m X 0,60m in the field, regularly weeded and the ground as rammed. On a ten meters circumference, in circle, lumps of earth were torn off then scattered. Oddly, the perennials plants such as the dandelions and the grass remained rooted. Two other inhabitants, who had not seen the machine, noted that the ground had been sucked up. During 4 years nothing grew in this place. Did the previous craft return and land, (which would explain the vacuum cleaning of the rectangular surface)? No one will never know! In this October 1954, other observations were made in the area: on 10 in Epoisse, on 11 in Lacanche, on the 14 in Meursanges, on the 16 in Saulieu." Monday October 4: in Poncey, Mrs. Fourneret and her son see a lengthened body emitting an orange light, 3 m broad, land at 18 m of their house. They flee. A little later armed neighbors invest the place and discover a large hole, very recent, whose appearance lets think that the ground was sucked up. One finds the missing ground nowhere. A case which was carefully investigated and later documented in Aime Michel’s excellent book Flying Saucers and the Straight Line Mystery (New York, Criterion Books, 1958) bears considerable resemblance, at least where the physical traces are concerned, to the Rosmead incident. On October 4, 1954, Madame Yvette Fourneret of Poncey, France, walked toward a window to close it. The time was approximately 8 p.m. and, she saw, about 20 yards from the house in the Cazet's meadow, a luminous body which appeared to be balancing lightly in the air to the right of a plum tree, as if preparing to land. She estimated that the object was about 3 yards in diameter, elongated, horizontal, and orange-coloured. The glow from the object threw a pale light on the branches and leaves of the plum tree. Frightened, she seized her son and ran next door to a friend's house where they tightly closed the door. At that point, two neighbours arrived, and seeing how frightened the women were, asked and were told what had happened. Armed with shotguns, the men ran toward the meadow, but when they arrived there, they found no object, but rather a very strange hole. Mr. Fourneret had been at a meeting at the Mayor of Poncey’s house and was sent for. The men then went about examining the hole in Mayor Cazet's meadow. What they found was strange indeed. An area measuring 27 inches wide at one end and 20 inches at the other appeared to have been "sucked up". White worms wriggled on the fresh soil of the hole, and the earth that had been torn up was scattered all around the hole in clumps 10 to 12 inches across over a radius of approximately 4 yards. On the inner edge of the hole, similar clods hung down, and the soil had been pulled out in such a manner that about halfway down, the aperture was wider than at ground level. There was no trace of any instrument which could account for the extraction of the earth and also the tiny roots and rootlets in the soil were intact everywhere on the surface of the hole. None had been cut, as would have been the case had an excavation taken place. Another detail was outstanding: in the centre of the holes lay a plant with a long root which was still attached by the end of the root to the soil at the bottom of the hole with all its rootlets exposed to the air and completely undamaged. It appeared that the mass of earth spread over the surrounding grass had been sucked out by a gigantic vacuum. The same was true of the earth which was strewn about on the grass. There were no cut roots, no trace of an implement, no evidence of burning, and no impressions in the ground. Many attempts were made to duplicate the hole but were met with no success. During the next few days, it was learned that many of the citizens in the area had seen a luminous object rise on one side of Poncay and shoot off into the southeast at 8 p.m., indicating that they had likely seen the same object that Mrs. Fourneret had seen hovering above the ground in Mayor Cazet's meadow. Many have theorized that the phenomenon at Poncey and the incident at Rosmead, South Africa were the result of a craft utilizing an anti-gravity method of propulsion, i.e., when the craft comes in contact or close to the ground, some of the earth is attracted to the object, and when it elevates and ascends into the air, the suspended earth material drops off. Of course, no exacting theory can be proposed until the mystery of the actual propulsion is solved. Until then, speculation is about the best that we can do. 1954 - Mrs. Fourneret, a housewife, ran away as an orange, circular object 3 meters in diameter that swung in midair and landed near her farm in Poncey-sur-Lignon, France. When Messrs. Girardot and Vincent arrived with rifles, they found that the earth had been "sucked up" over a quadrilateral area. Francois Bouiller confirmed he had seen a luminous object in flight. Extensive investigation by French Air Force and police. (Sources: Liberation, October 7, 1954; Aime Michel, Flying Saucers and the Straight Line Mystery, p. 134; Jacques Vallee, Anatomy of a Phenomenon, p. 71; Jacques Vallee, Passport to Magonia: A Century of Landings, p. 217). 20:00 In Poncey-sur-l'Ignon (France), Mrs. Fourmeret (housewife) flees at the sight of a lengthened body (circular?) emitting an orange light, 3 m in diameter, swinging itself in the airs and which lands at 18 m of their farm. They flee. When neighbors, Misters Girardot and Vincent arrive with their rifles, they find a large hole, as if the ground had just been "sucked up" on the surface of a quadrilateral. Mr. François Bouiller will confirm to have seen 1 luminous object in flight. An investigation will be carried out by the Gendarmerie and the French Air Force. The missing ground will be nowhere to find. Jérôme Beau indicates as sources: "Franc-Tireur, l'Aurore, Libération, 7 October, France-Soir, Paris-Presse, 8 October 1954, Vallée, J.: Anatomy 71". Luc Chastan notes in his database that in the "Côte d'or" in Poncey sur l'Ignon on October 4, 1954 at 19:30 hours, "While, being in his bedroom, a first witness closed his shutters, she sees with aboutfifty meters of her home and above the trees, a luminous body the size of a cooker which swings gently in the air, on the right of a plum tree. This object lights the branches and the leaves of the tree. Frightened she flees, with her child in the arms, at her neighbor's, passing by the back of her residence not to be in contact with the luminous phenomenon. She can explain what she has just seen only five minutes later to her neighbor and a friend of the latter. One hour later the neighbor's child and the husband of the friend arrive, they alert another neighbor and then move to the place, armed with their shotguns, and accompanied by the first. In the meadow contiguous to the yard, they discover traces. Another member of the family of neighbor who came back home towards 20:45 saw an unknown object in the sky in the shape of large cigar, kind of plane fuselage but shorter and without wing, entirely luminous, the color which one would have believed to be transparent had green and orange reflections. It could be at one thousand meters of altitude, it moved north to south, a speed double than that of a jet. Frightened, he returned home, he found the members of his family who had already noted the traces left by the luminous ball. These were at a few meters of the plum tree whose foliage had been lit by the ball, on a surface long of 1 m 50, broad at its base of 70 cm and its end of 50 cm, the grass had been like sucked up. Grass sods of 0 m 20 to 0 m 30 were widespread and turned over around on a radius of 4 meters. On the very fresh abrasion, white worms were still agitated. The commander of the gendarmerie squad went on the spot. An investigation was carried out and was the subject of the official report number 391 of the squad of St-Seine-l'Abbaye. Samples were taken. A lump of earth was presented to a Geiger counter of the university of Dijon. Result: nothing, no radioactivity. A mound was examined by Aimé Michel with instruments of the institute of the radium with the same failure, this small piece of ground will be thrown away finally." The author indicates that on October 4, 1954 in Poncey-sur-l'Ignon, small village located at 40 kilometer of Dijon, at approximately 20 hours whereas the night had already fallen, Thérèse Fourneret, young 23-year-old mom, was on the point of closing her shutters. She did not believe her eyes when she saw at some 20 meters of her, at the level of the family plum tree, an apparatus, a kind of disc, flattened at the ends, which seems "to swing, a bit as if it prepared to land", according to her statement to the investigators. She indicated that the machine was about three meters in circumference and released a weak orange yellow gleam. She immediately grabbed her child under the arm and ran to take refuge at a neighbor's. The two women in a crisis of panic barricaded themselves while waiting for the return of the men. One hour after the observation, Thérèse Fourneret accompanied by two heavily armed neighbors approaches the plum tree. There is nothing, except a trace that will be called thereafter the "hole of Poncey". The author indicates that the documents of time provide a detailed description of the print: "On a surface long of 1 meter 50, broad at its base of 70 cm, the ground had been like sucked up. (...) The torn off ground was widespread all around the hole on a radius of 4 meters approximately (...) No trace of instrument explained the extraction of this ground mass (...) All occurred as if the ground mass had been sucked up by a gigantic vacuum cleaner". The author indicates that there were moreover no traces in the neighbourhoods, that Thérèse Fourneret thus did not hallucinate, that the news "spread like a fart on an oil-cloth", that the gendarmerie of Seine-Seine-l'Abbaye is dispatched on the spot to investigate, as well as the air police force of Dijon, the Air Force and than several scientists. They carried out analyses, took samples, compared testimonys and all without exception would reject the thesis of imposture, without giving tangible explanations. The investigation showed "the reality of a landing". "Of whom? Of what?" The author notes that during four years nothing grew on the "hole of Poncey", not the least bit of grass, and that the mystery, 53 years later, remains whole. Let's temporarily leave aside the question of the UFO photographs, and come to our first category of physical traces, primarily represented by the traces. If one limits oneself to France, it is possible to enumerate some two or three hundred cases of this kind, more or less richly documented. A few tens of examples of traces of unspecified origin are added to it, one does not know if it is necessary to allot their origin to the UFO phenomenon or to some other unknown (and possibly, natural) causes. Among the most remarkable cases, one can quote a small number of incomprehensible cases of excavations. The extraordinary UFO flap of the second half of 1954 provided an excellent example, with the hole of Poncey-sur-l'Ignon, appeared on October 4, little after 8 p.m., following an observation, by several people, of a UFO moving very close to the ground. "On a long surface of 1 m 50, broad at its base of 70 cm and its end of 50, the ground had been like sucked up. On the very fresh abrasion, white worms were still moving. The torn off ground was spread all around the hole in packs of 30 cm in diameter, on a radius of 4 m approximately. On the internal edge of the hole, packs of ground hung towards the interior: the ground had been eroded under, so that at middle height of its average depth, the surface of the hole was vaster than on the level of the ground. But most astonishing is that no trace of instrument explained the extraction of this ground mass. Even better (and it is that especially what was never explained): the small roots and rootlets (...) were intact on all the internal surface of the hole; none was cut, as it would have been if one had dug the excavation with any known means (...) In short, all occurred as if the ground mass spread in the grass around the hole had been sucked up by a gigantic vacuum cleaner." Gendarmes (captain Millet, of Semur-en-Auxois, then major Viala, of Dijon, noted the fact, just as a professor of the university of Dijon and general of Chassey, of Air Force, did. No satisfactory explanation could be found. Unless wanting at all costs to deny the existence of the UFO phenomenon, it must be admitted that the only possible cause is the saucer, luminous, of orange color and approximately 3 m in diameter, observed the same evening by Mrs. Fourneret above the site of the hole, and a few moments later by François Bouiller and several other people. The hole of Poncey, like the photograph of Los Angeles, is the proof of the reality of the UFOs. But a proof has effect only if it is known, if it is taken into account. An ignored, or occulted, proof, is a proof without effect. And silence fell, very quickly, on the Poncey case like on a good number of other UFO cases. As of the days which followed the discovery of the trace, the major press was of an exemplary discretion on this business, which undoubtedly was a bit too solid. In 1979, a book - which I do not recommend the reading to anybody - was published, which claimed to discard the 1954 French flap. This book [Barthel and Brucker's "La Grande Peur Martienne"] (a subtle mix of libellous untruths and innuendo) does not even mention the Poncey-sur-Lignon case. There are silences say a lot! The website indicates that on 4 October 1954 at 20:00 in "Poncey-sur-Lignon", France, Mrs. Fourneret, a housewife, ran away as an orange, circular object three meters in diameter swung in mid-air and landed near her farm. When Messrs. Girardot and Vincent arrived with rifles, they found that the earth had been 'sucked up' over a quadrilateral area. Francois Bouiller confirmed he had seen a luminous object in flight. Extensive investigation by French Air Force and police." The website comments that it was a "Close encounter with a an unidentified craft and its occupants" and "One orange star was observed by several witnesses in a field for ten minutes." The sources are indicated as: Webb, David, HUMCAT: Catalogue of Humanoid Reports; Vallee, Jacques, Computerized Catalog (N = 3073). *Oct. 4, 1954 - At 8:00 p.m. Mrs. Fourneret, a housewife, ran away as an orange, circular object 3 meters in diameter that swung in midair and landed near her farm in Poncey-sur-Lignon, France. When Messrs. Girardot and Vincent arrived with rifles, they found that the earth had been "sucked up" over a quadrilateral area. Francois Bouiller confirmed he had seen a luminous object in flight. Extensive investigation by French Air Force and police. (Sources: Liberation, October 7, 1954; Aime Michel, Flying Saucers and the Straight Line Mystery, p. 134; Jacques Vallee, Anatomy of a Phenomenon, p. 71; Jacques Vallee, Passport to Magonia: A Century of Landings, p. 217, case # 194). Summary: observation of several phenomena in two days on the same commune: lack of information. On October the 2, and 4, 1954, several people of the commune of Poncey-sur-l'Ignon (21) will be witnesses of phenomena which intrigue them. The report gives a report on the two distinct series of events in the same sector chronologically treated here. The first event takes place on October 2, 1954, in Poncey-sur l'Ignon. At 07:40 p.m., a farm woman (T6) who just milked her cows, first notices in the sky "a luminous craft" "related to all that one sees in the Press these days". The witness reports she saw "like a moonbeam" that "lighted the court". She thinks it is the moon but discovers that it has a weird shape. Staring at it, the witness then observed a vertical cylinder which she estimates to be 1,5m high and of a diameter of 80cm. It is luminous on all its surface, of orange color with a green reflection around and moves upright at low height and rather close to the buildings. Convinced what it is not the Moon but an unknown "craft", she informs her husband, her son and a neighbor (T7). The latter has time to see the light coming from the North to disappear towards the South. The neighbor (T7) described a luminous ball like a soccer ball more orange than an electric bulb and moving silently. A confusion with the Moon, maybe partially hidden by moving clouds, cannot be excluded in spite of the denials from the witness. The Moon is indeed very low on the horizon (6°) in the South-west (azimuth 220°). In his testimony, the witness T6 does not specify exactly her location and the direction of observation ("in the sky"); moreover she does not indicate to have seen at the same time the Moon and "the craft". The witnesses describe a move of going away at low speed "towards the South" but the description of disappearance is too vague. However, the phenomenon presents similarities with other accounts two days later in the same commune (see below). This first case is classified C for lack of information. The second series of events takes place on October 4, 1954, in the Val d'Ignon at the locality 'the asbestos factory" within 1km in the south of the village of Poncey-sur-l'Ignon (21). This locality is composed of a group of buildings of which a part is used as dwelling by three families of workmen. It is surrounded in the North, the East and the West by meadows and in the south by a pond. Towards 07:30 p.m., as she closes the shutters of her bedroom, a young woman (T1) sees in direction of the North, above a plum tree located in the court, a rather strong light of yellowish color, in the shape of a mushroom it seems, oval at the part higher and round at the lower part, looking like a transparent sphere lighted from the inside. She estimates its height at about fifteen meters, its distance to 50 m and compares its size with that of a cooker. No particular noise is heard. She looks at it only a few moments and cannot specify its state of movement. Taken of panic, she takes her child and will seek refuge at a neighbor's (T2) who is alone with her daughter (T3). No other witness will observe this phenomenon. Towards 08:30 p.m., the son-in-law (T4) and the son (T8) of the neighbor arrive and find the three women afraid. Together they go in the meadow contiguous to the court at the place in the direction of observation of the phenomenon by T1. They note the presence of a roughly rectangular area (1,50 X 0,50-0,70 m) dug in the ground (on 5 cm) with ground broken at the two ends and the grass and lumps of earth spread around in a circle of approximately 4 m of ray. The mounds of unequal sizes (in general 30 X 20 cm except two of 60 cm) are turned over grass downwards. Two witnesses (T2 and T4) report the presence of many worms alive at the medium of the traces. Towards 08:45 p.m., the second son of the neighbor (18) (T5), returning from work at the next village distant of 1,5 km, briefly sees in the sky, a "craft" in the shape of cigar without wings, entirely luminous, of "transparent" color, with green and orange reflections which very quickly crosses the sky in North-South direction. Frightened by this vision he returns quickly at his parents'. No other witness will observe this phenomenon. The gendarmes are alerted on October 5 at 07:30 p.m. and note the traces on the ground that very evening. They proceed to the investigation and constitute the photographic file on October 6, 1954. They examine the possibility of a joke by the son-in-law and the son of the neighbor (the more so as while returning home the 4th at the evening the latter planned to make a prank in connection with a flying saucer!) but, after checking of their use of time, the gendarmes reject this assumption. According to T4 who lives the district no cattle is in the grazing ground in the meadow and he did not see anybody wander at this place the day before. A fast examination of the facts suggests four assumptions for this second observation: for the luminous phenomenon the moon or a headlight of a vehicle on the close hill, and for the traces on the ground a ground digging by wild boars in the search of worms or a hoax. The Moon is indeed rather low on the horizon (16° rise). However it is in the South (azimuth 197°). And the statement specifies that the observation was done towards the North. A precise reconstitution of the places based on photographs (see chart of reconstitution) confirm that there is no error there and that the window from where the witness made her short observation does look to the North. The assumption of the Moon fails. The headlight of a vehicle on the road D26 or in the turn of the D103 could have been visible from the site of the witness towards North (see chart IGN 1963 where one notes that the vegetation cover is not very dense). But this assumption cannot be confirmed by ignorance of the exact place of the observation and of the precise direction of the phenomenon. A private investigator went on the spot in August 2015 to try to specify the topography of the observation: the places changed little but the inhabitants of 1954 do not live on the spot any more or died. GEIPAN tried to join by telephone and mail one of the witnesses but without success. About the traces on the ground, the assumption of wild boars does not appear in very good agreement with descriptions made of the excavation: relatively clear edges, mounds deposited out of the excavation and rather regular in the face and position (returned), worms not eaten (the wild boars could have been disturbed). The photographs of the traces made by the gendarmerie were taken two days after the observation. Moreover these traces were trampled by the witnesses. This assumption remains acceptable but not confirmed. The assumption of a hoax performed by others people cannot be completely excluded. Can the luminous phenomenon be regarded as the cause of the trace? The data available do not provide any direct proof of a cause link. One must be satisfied with the correlation of direction of observation of the two phenomena (light and traces on the ground) and relative correlation of time in a one hour interval. An interrogation of the same order applies to the observations of 07:30 p.m. and 08:45 p.m. (T5) but with a less strong association: distance of 1 to 1,5 km approximately between the witnesses (the exact place of the observation of 08:45 p.m. is not specified) and separation by 1 hour approximately. The agreement of descriptions (yellowish or orange light, impression of transparency) remains limited. There is also some resemblance between the observations of October the 2nd and 4th: same village, same hour of the day, same light ("orange with green reflections", "green and orange reflections"), even same apparent size ("cooker", 1,8 X 0,8 m, traces 1,50 X 0,60 m). In short the case of observation of October 4, 1954, brings back three events: two distinct observations, short, by a single witness each time, of a remote luminous phenomenon. Then traces on the ground. These three events are not inevitably associated between them. For each one of these events there are fragile assumptions which cannot be confirmed. Broadly the consistency of this case is average for it does not contain verifiable elements. Its strangeness would be strong if one could correlate in an unquestionable manner the traces on the ground and the luminous phenomena. GEIPAN consequently classifies this case C for lack of information: the verifiable elements are too weak compared to the supposed strangeness of the case. Notes: it should be known that during the year 1954 and particularly in October, the national and local press published a large number of articles about supposed cases of UFO observations. This phenomenon of great extent impressed the population and caused many reports of observation of phenomena which finally proved very ordinary (stars, planets, planes, fireballs...). In this official report of gendarmerie, the various witnesses very often refer so that they read recently in the press in particular to describe the phenomenon. From right to left: Mrs Fourneret showing peculiarities of the trace to reporter and ufologist Charles Garreau and ufologist Jimmy Guieu as they investigated the case and interviewed witnessed on location. Poncey-Sur-l'Ignon is a small village of the department of Côte-d'Or, in the area of Burgundy, and had approximately 140 inhabitants at the time of the events. [---] indicates sources that I have not been able to check yet. [---] Article by Charles Garreau in the regional newspaper La Bourgogne Républicaine, France, October 7, 1954. [er1] Article in the regional newspaper L'Est Républicain, France, October 7, 1954. [cg1] "Rapport d'Enquête: Poncey-sur-L'Ignon (C. d'Or. - France) - 4 octo. 1954 - Atterrissage", by Charles Garreau, in the ufology magazine Ouranos, France, pp 37-38, 2nd quarter, 1955. [---] "La Propulsion des Soucoupes Volantes par Action Directe sur l'Atome", book by Jean Plantier, Mame publishers, France, pp 117-118, 1955. [---] "Alerte dans le Ciel", book by Charles Garreau, Grand Damier publisher, France, page 239, 1956. [---] "Flying Saucers in Europe", article by Aimé Michel, in Fate magazine, USA, Vol.10, No.12. Issue #93, Mary Fuller publisher, pages 34,35, December 1957. [am1] "Mystérieux Objets Célestes", book by Aimé Michel, Seghers publisher, France, pp 183-188,190, 1958. [lo1] "UFO the Whole Story", book by Coral and Jim Lorenzen, The New American Library publishers, Signet Books, USA, pp 174-175, 1969. [am1] "A Propos des Soucoupes Volantes", book by Aimé Michel, reprint of "Mystérieux Objets Célestes", Planète publishers, France, page 167, 1972. [am1] "A Propos des Soucoupes Volantes", book by Aimé Michel, reprint of "Mystérieux Objets Célestes", Planète pubilshers, France, page 167, 1972. [mb1] "Des Soucoupes Volantes aux OVNIS", book by Michel Bougard, SOBEPS publishers, Belgium, page 193, 1976. [hd1] "Premières enquêtes sur les Humanoïdes Extraterrestres", book by Henry Durrant, Laffont publisher, France, page 199, 1977. [fr1] "OVNI, Premier Dossier Complet des Rencontres Rapprochées en France", book by Michel Figuet and Jean Louis Ruchon, Alain Lefeuvre publisher, France, pp 119-120, 1979. [cc1] "Ephémérides des Années d'Espoir de l'Ufologie", article by Gilbert Cornu and Henri Chaloupek, in the ufology magazine Lumières Dans la Nuit (LDLN), France, #255-256, page 26, September/October 1985. [lg1] "The Fifth Horseman of the Apocalypse - UFOs: A History - 1954 October", monography by Loren Gross, USA, pp 9-10, 1991. [gc1] "UFOs and Anti-Gravity: Piece for a Jigsaw", book by Leonard G. Cramp, Adventures Unlimited Press publishers, U-K., page 132, 1997. [js1] "Le Dossier 1954 et l'Imposture Rationaliste", book by Jean Sider, Ramuel publishers, France, pp 244-245, 1997. [bp1] "Les Premiers OVNI Aperçus à Poncey-sur-l'Ignon Il Y A 46 ans. Peut-On Y Croire? ", ("The first UFOs seen in Poncey-Sur-l'Ignon 46 years ago. Can it be believed? "), article dans le journal "Le Bien Public", Dijon, Côte d'Or, France, October 22, 2000. [jb2] "Cinquantenaire d'une grande vague d'OVNIS", article by Jérôme Beau, in the sensation magazine Top Secret, France, #15, page 34, 2004. [md1] "Flying Saucer Occupants and UFO occupants by Coral and Jim Lorenzen", compiled by Michael M. Deschamps, electronic text, not dated. [gc1] "A la Une - OVNI: Mythe ou Réalité? ", article by Roald Billebault, in La Gazette de Côte-d'Or, Talant, France, May 10, 2007. 1.0 Patrick Gross March 16, 2009 Conversion from HTML to XHTML Strict. First formal version. Additions [hd1], [mb1], [js1], [go1], [dj1], [jb1], [lc1], [gc1], [ud1]. 1.2 Patrick Gross March 6, 2010 Addition [gc1], [pb1]. 1.5 Patrick Gross July 9, 2010 Addition [lm1]. 1.6 Patrick Gross October 9, 2014 Addition [ni1]. 1.7 Patrick Gross November 3, 2016 Additions [er1], [fa1], [lo1], [lg1], [md1], [jb2], [ub1], [ge1]. 1.8 Patrick Gross February 15, 2017 Addition [ub1].